4.7 stars from 2537 reviews. Labels matter. We know what it can be like to feel as if all of your quality comes down to one small calibration label. We run QCLabels.com because we know, with hundreds of instruments to monitor, employee records and daily shipments to maintain, each small quality control label plays a vital role. Although a Calibration and Quality Control label can never “fix” a broken quality program, your traceability and maintenance procedures are built on labels. They are a critical signal that you are in control. Quality means dependability and continuous improvement. Calibration labels, quality control labels, and the quality industry have changed over the past few decades. You can now customize any label with your organization's name to avoid confusion. 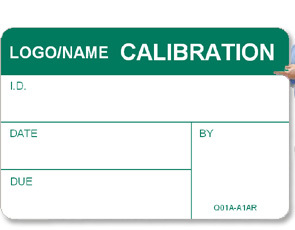 There are countless variations in calibration label materials, sizes and legends. The exploding complexity of new devices, assets and inventory require new or updated labels to continue organizing and managing your system well. Join our growing list of satisfied customers.